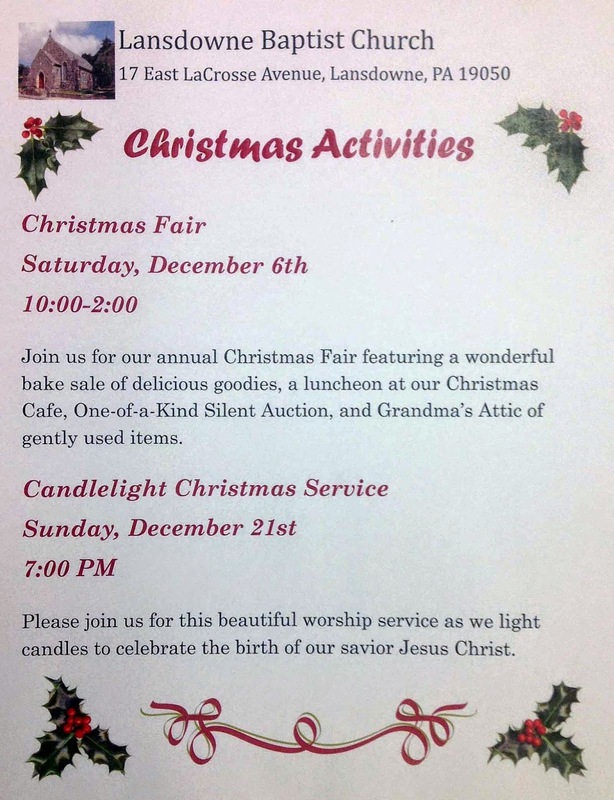 You are invited to join us for both our Christmas Fair on Saturday December 6th from 10:00 am to 2:00 pm AND our Candlelight Service at 7 pm Sunday, December 21st. Both are wonderful and well worth your time. Set up and waiting for the community to arrive! 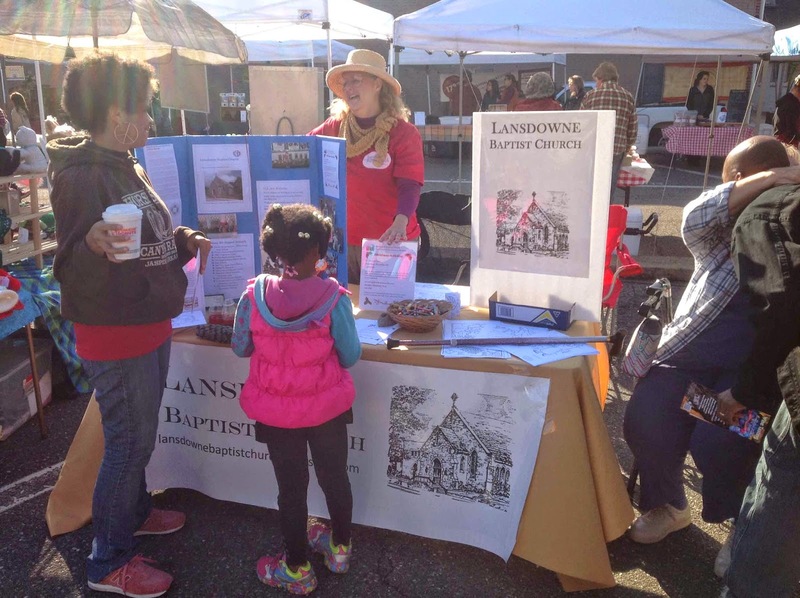 On a sunny Saturday morning, members of Lansdowne Baptist Church joined in the local Farmer's Market Community Day, October 25. It was a terrific opportunity to talk with and introduce ourselves to members of the community and invite them to our annual Christmas Fair and Candlelight Service in December. We put our best foot forward with our displays and our friendly members. It was wonderful to see what special talents each member of the team brought to the effort. While one member took fliers around to hand out, several greeted people who came to the table, others with craft skills created cup and ball games for the kids from recycled materials. We learned a lot that day and met some wonderful people. It was also a great time for the church members working the table to get to know each other better and fellowship with one another. We look forward to being there again next year. To sum up the message: "All are welcome!" 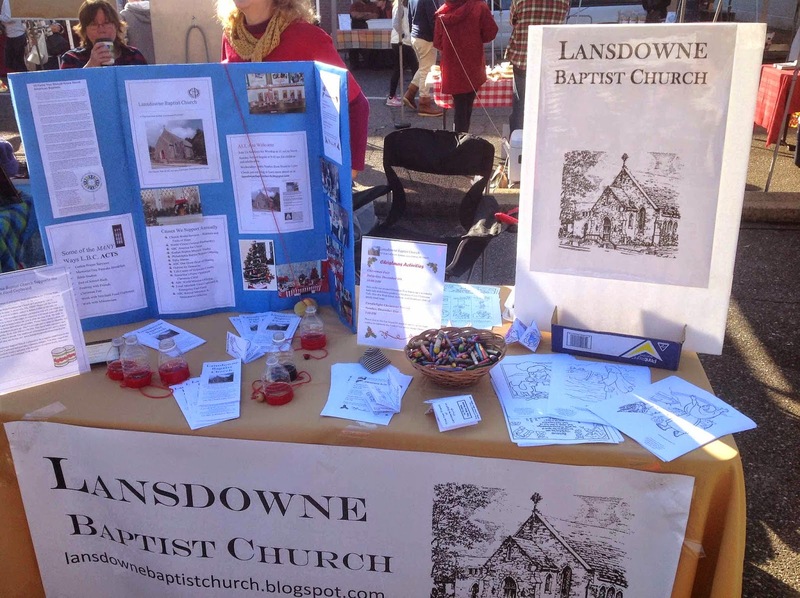 Lansdowne Baptist Church members attended the annual Philadelphia Baptist Association mission banquet this October. The emphasis was hospitality and outreach to the community, including the immigrant community. One of our own received recognition for her years of diligent service to a local interfaith food cupboard. 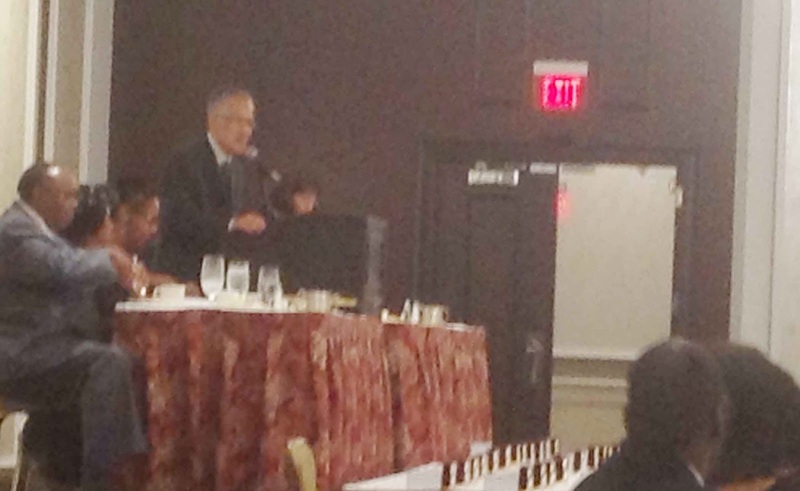 The president of American Baptist Churches USA, Don Ng, was the keynote speaker. He told the moving story of his father coming to the United States, fighting in World War II and receiving citizenship based on that sacrifice. Don Ng told of the struggles to bring his father's wife and son over from China to join him. The First Baptist Church of Boston assisted Mr. Ng in his efforts and helped his family after their arrival in the US. This church helped them navigate the rough waters faced by all immigrants to this country. Mr. Ng spoke movingly of the trouble he faced as a child growing up in America, a first generation child of immigrant parents who was not treated well or taken seriously by the school system he was raised in, even as a native-born son of the US. He called all churches to assist immigrants in their struggles and make a positive impact on their lives. Thirty of the PBA's 129 churches were represented in that banquet hall at the Hilton Hotel in Philadelphia, providing over 600 members to celebrate in fellowship together. The youngest recipient of an award for community action was eleven and her efforts were well recognized. I wonder what we will accomplish together for next year? Fall Back for November 2nd! Just a little scheduling reminder from Lansdowne Baptist Church to set those clocks back an hour Saturday night, November 1st. 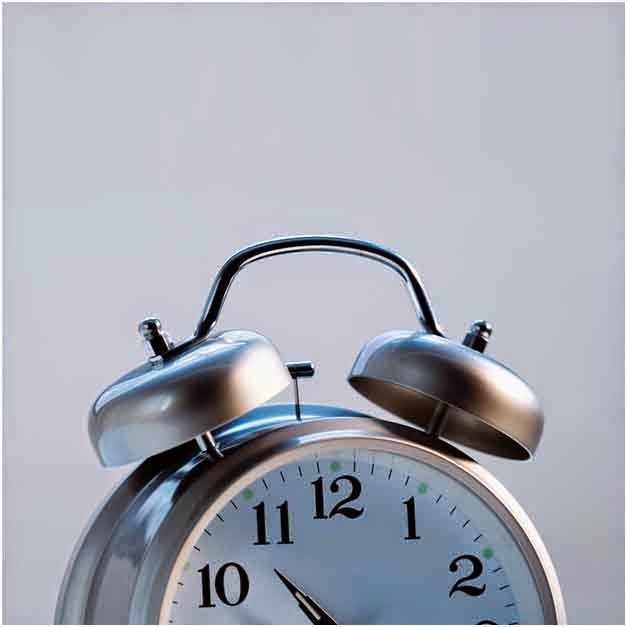 It is time to "fall back" and gain an extra hour's sleep so we'll all be bright-eyed, bushy tailed, and on time for Sunday School and worship! If you are in the area, you have an open invitation to stop by on Sunday. We will be glad to meet you. Due to technical difficulties, the camera was not working today. However, the message is too important not to offer for consideration. Below is the complete transcript of the sermon. This is, without doubt, the hardest sermon I’ve written. Philadelphia Baptist Association has asked pastors to preach this Sunday on domestic violence awareness. While it is not entirely clear what all leads to domestic violence, an often silent and hidden epidemic in our culture and our churches, it is known that conditions leading to family stress ignite it. Right now, economic growth is below normal. Unemployment rates remain too high. Those individuals suffering beneath the poverty line have increased to roughly 50 million, around one in every six persons in our population. As we have seen working with the Interfaith Food Cupboard, the rate of food insecurity is far too high. Opportunities for advancement have dwindled. This is an incredibly stressful environment to live in and fertile ground for domestic violence. According to the pamphlet available from PBA, 2,135,000 women and men are abused annually by partners. Numbers like this can leave us feeling helpless and wanting to withdraw. However, using God’s methods of mercy and peace, as seen in today’s Scripture reading, we Christians can make a difference. Moses was an extraordinary prophet and leader. Moses had an amazingly close relationship with God. We are told Moses had God’s Spirit, received a divine calling and divine revelation from God. Moses spoke with God’s words. Here was the prophet who led the Israelites out of slavery in Egypt. Moses formed this “stiff-necked people” into a nation. Listening to his father-in-law’s advice, he gave them a judicial system. All of the prophets who came later were compared with Moses. In the New Testament, parallels were made between Jesus and Moses, so powerful was Moses’ legacy. In Deuteronomy 34:10, it is written, “there has not arisen a prophet since in Israel like Moses, whom the Lord knew face to face.” No one short of Jesus would be used by God so intensely as an instrument of revelation. God spoke to Moses clearly and Moses saw God’s form without dying. And yet, Moses, for all his virtues, was a human being filled with human flaws, human fears, and a human temper. In his youth, Moses struck down an abusive Egyptian beating a Hebrew and fled to Midian to evade Pharaoh’s wrath. Later, in the wilderness of Zin, after the death of Miriam, Moses’ sister, at Kadesh, Moses was caught up in a quarrel among his people. They were waterless and sure they were going to die. They were accusing Moses of poor leadership, bringing them to this hostile place. God told Moses and Aaron to command the rock to yield water before the assembled crowd. This would be a sign of God’s power and holiness. Instead, Moses, apparently with temper flaring, proclaimed, “Listen, you rebels, shall we bring water for you out of this rock?” Striking the rock with his staff twice, the water came. God saw this action as Moses’ lack of trust in God and God’s methods, stating, “Because you did not trust in me, to show my holiness before the eyes of the Israelites, therefore you shall not bring this assembly into the land that I have given them.” Moses was neither free of fear nor sin, though God made great use of him. For many centuries, that judgment, in the face of all Moses did right, has worried scholars. Many explanations have been offered but none seem to satisfy. Right now this is a painful story of judgment, harsh judgment. And Moses was about to die. Will this story be redeemed? There is a modern story about which we can ask the same painful question. Moses was in a situation of high stress both times when his temper got the best of him. The people of Israel became those famous “stiff-necked people” arguing and abusive when they were stressed as well. Great social stress today leads to domestic abuse, as we have seen. That is the dangerously fertile soil into which the evil seeds of cruelty fall and thrive. Seeking out an explanation for the cruelty involved in domestic violence, I turned to the Dictionary of Pastoral Care and Counseling. The experts there explained that our life’s expectations are “mapped out” early in childhood. Those expectations grow as the years roll by and impact behavior. Generally speaking, if a child received love and care, those are the expectations mapped out for later life and that child is likely to be loving and caring. However, when a child is told constantly and unfairly that he or she is bad and is treated with cruelty and violence, the map of life’s expectations is altered and behavior changes. That child will likely exhibit cruel behavior later in life. Victims become victimizers as they try to decrease painful, pent-up feelings from their own trauma. This awful and wrong cycle perpetuates. Again, this is general. There are exceptions. Sadly, social attitudes going all the way back to the Code of Hammurabi, the oldest legal documents, have been lax on domestic violence. In the Code, the rights of a husband to discipline a wife and children as he saw fit were affirmed. 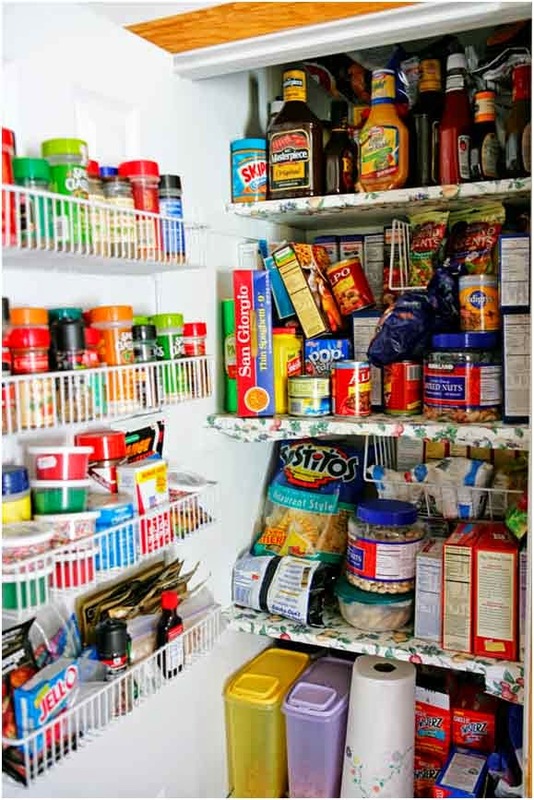 In time, restrictions were placed on how men might exercise this right. By the 19th century, social reform movements made child and wife abuse less excusable. However, today, while there are laws in every state prohibiting assaults on family members, all too often there is reluctance to enforce them. Batterers are rarely charged and victims are encouraged not to press charges. Worse, victims are often blamed as being complicit in the abuse. Any community that tolerates interpersonal violence perpetuates it and passes it on like toxic seeds to the next generation. For instance, a 28-year-old contractor filed for divorce from his estranged wife, a wife he declared he no longer loved. One day, cancelling his wife’s home insurance, he obtained the necessary permits and demolished her three bedroom home. Fortunately, she and their three children were away. Quite a few men in the community called this violence “bulldozer justice” and supported the contractor. His community let it be known that violent, vengeful attitudes and behaviors were legitimate ways to end family disputes. Christian families are not exempt from this crisis. Some years ago, Methodist church women were surveyed and 68% revealed they had experience with abuse. Domestic abuse is a crisis facing peoples of every social and economic class, every ethnic group, both genders, all ages, and every faith. Like our story from Deuteronomy, at this point it feels like terrible, harsh judgment and leaves us in a quandary as to what we should do. It is easy to imagine ourselves standing on some high mountain, looking longingly off into a promised land, but unable to reach it. While this is a story of God’s judgment, it is even more a story of God’s mercy and peace. In the Bible, among the nation of Israel, the infirmities of advanced age were often used to portray God’s judgment against the people. Weakness is the result of sin and rebellion. And yet, Moses, a man of 120 years was clear-sighted and vigorous. Moses’ past actions may have denied him direct access to the Promised Land, but God’s judgment is further muted by his treatment of Moses at the end. God is very gentle with his faithful, dedicated, if sometimes prickly servant. God grants Moses a rare delight. Ascending Mount Nebo, some 2,600 feet above sea level—there’s vigor in a 120 year old for you—God provides Moses with a view of the entire Promised Land as no mere mortal could. Moses sees in detail the future homes of the various tribes of Israel. God reminds Moses, “this is the land that I swore to Abraham, to Isaac, and to Jacob …” when the tour is finished. The promise was about to be fulfilled. God shows mercy to Moses and Moses receives that mercy with acceptance, receiving also God’s peace. Throughout Moses’ long life he responded with a range of emotions to God’s calls. At times Moses was filled with self-doubt and fear, then with bravery in the face of great danger, and even offering up a gentle reproach to God to calm things when the people were at their worst. Just once did he stumble as God’s prophet, at Meribah, as his impatience and temper rose with his people. One scholar wrote that since Moses was a model for his people for all time to come, the price Moses paid for that lapse was high. Yet, when God’s justice collides with God’s mercy, as it did here, mercy prevails. In the end, the text even suggests God may have buried Moses God’s-self, providing a final moment of startling closeness in the relationship between God and his prophet. God helped Moses with his final mile on this earth. The text suggests, in Moses’ quiet observation of the Promised Land and his ending without complaint that Moses had serenity in the face of God’s mercy and peace. It is a hopeful end. How might we use those great qualities of mercy and peace today to change lives and offer hope to those struggling with domestic abuse today? Last week Paul asked the Thessalonians to do the “work of faith and labor of love” by imitating Paul’s efforts among the church. This week, in this story of Moses, we can see ourselves imitating the ways of God, the ways of mercy and peace. We can also take the message away that, even in the face of the turmoil created by domestic violence and the circumstances that aggravate it, we should continue to have faith. God’s great age of the peaceable kingdom will come and we can strive for the mercy and peace it represents in the here and now, seeing it from afar like Moses from Mount Nebo. Like Moses, we may not live in the Promised Land in which such violence is finished forever, but we can work toward it. We can have faith, like Moses, that God will guide us in our work. From this Scripture lesson we can also take the lesson that while our efforts might not be complete, like Moses we can pass them on to another generation and have our work continued, just as Joshua continued Moses’ work with the people of Israel. Using God’s example of mercy over judgment and peace over wrath, we can contend with domestic violence. This never appropriate behavior is criminal assault. It includes physical and emotional abuse and neglect. The intent is to control others in the relationship. Victims include children and adults, males and females, the single and the married. Domestic violence takes on many forms, including name calling, putdowns, isolation from family and friends, withholding money, preventing partners from getting or keeping jobs, actual or threatened harm, assault, stalking, and intimidation. There is much we can do to help work against this crisis. Churches like ours can provide emergency help for victims. We can help victims get the legal, medical, and social help they need through persistent advocacy on their behalf. When no emergency centers are available, some churches have developed host home networks for temporary safe housing. We can also help victims and families recover from long-term effects of abuse with guidance to counseling services and by sponsoring support groups. We can offer violent families the chance to build positive bridges with others, breaking their isolation for a healthier way of life. As a church, we can also offer up nonviolent images of family life so needed today. We can provide family-life education programs that offer instruction on non-abusive ways of parenting and conflict resolution. Pastors are offering up premarital and post-marital counseling to address domestic violence prevention. American Baptist missionaries Ray and Adalia Schellinger, and their partners in Tijuana, Mexico, are working against domestic violence there with Deborah’s House, a shelter for women and children escaping severe domestic violence fostered by a harsh economy paying less than $1 an hour that demands 50-60 hour weeks, and offers no child care—when work can be found. At Deborah’s House, women learn the sewing business. Working together, these women form a business that allows them to make salaries three times higher than factory rates, allowing them to spend more time with their children, and frees them from violence. Ray and Adalia also provide counseling for abusive men, guiding them toward different, non-violent ways. Using God’s approach of mercy superseding judgment and peace instead of wrath, we can work against this terrible crisis of our age. Dedicated to this effort, we can make a difference. Exploring the Ten Commandments and what they mean for us in today's world. "This covenant was an invitation for the people to accept God’s love for them and choose to live the better lives God would have them live. That remains true for us today, all around the world." Fun fact: "As an interesting aside, the law “honor your father and mother” was particularly aimed at the old and infirm. It let the people of Israel know that, unlike some other nations, it was not okay to send the old folks off on a trip in the hopes they’ll either be eaten by wild animals or die of exposure. If you wanted to stay on the land God gave you, you’d need to maintain higher, more humane family standards." If you find yourself in the the Lansdowne, PA, area any Sunday, consider yourself to have an open invitation to come and worship with us. You will be most welcome! From Paul's letter to the Philippians, Chapter 1, verses 20-30, delivered on September 21, 2014. Sermon based on Romans 14:1-12, in which Paul grapples with the issue of cooperation and the law. Timely for us all. We are in the early experimental stages here at Lansdowne Baptist Church in recording sermons. We brightened this one a bit. We are living in a highly charged, vastly divided, increasingly angry society that appears to be bound and determined to debate ... everything! Sadly, such debate rarely gets us anywhere, except for further divided. Here are three readings that offer up a different solution, actually talking to each other and listening to what others have to say, respectfully. We recently used these to establish guidelines for civility in our Bag Lunch Bible Study class (to which you are invited) on Wednesdays, which is working beautifully if I do say so myself. All three make compelling points and offer up a more loving alternative to the modern trend. If we all gave it a try, who knows what might come of it??? 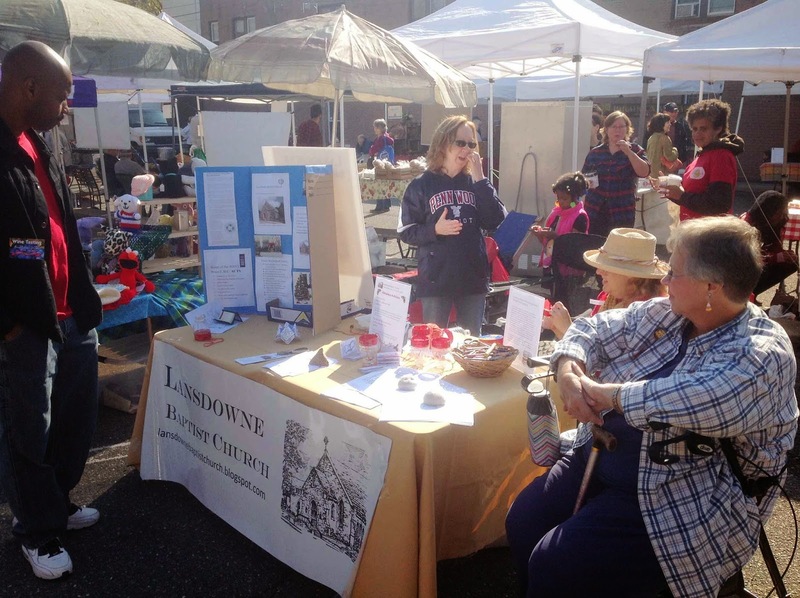 Any Sunday you find yourself in or near Lansdowne, Pennsylvania, you have an open invitation to visit us. We'll be very glad to see you ... and to listen with great interest to what you have to say. Jim & Casper Go to Church by Jim Henderson and Matt Casper. 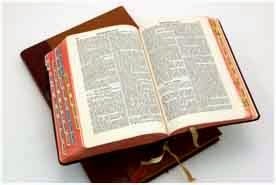 The New Oxford Annotated Bible (NRSV). The President's Devotional by Joshua DuBois.